I'm always open to guest bloggers on Tinsel & Tine! Although normally those I asked to write something, always say - "Yes, great I'd like to do that", and then never write a bleeping word. Those that contact me, of course want to include a link. Which is fine as long as the link goes to something above board, and most importantly, the post is well-written and pertaining to film or food or ideally both. 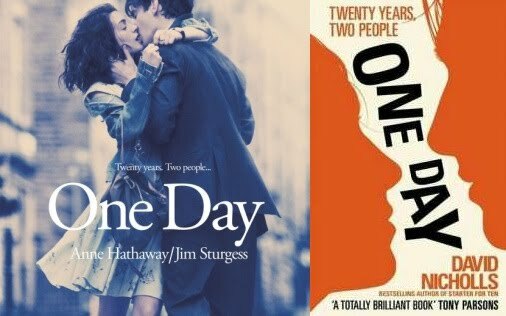 When David Nicholls’s novel, One Day, hit bookshelves back in 2009 it quickly became a phenomenon. After being translated into 31 languages it appeared on best seller lists throughout the world and became the highest selling novel of 2010. It was therefore only a matter of time before someone set about transforming this modern day love story into a motion picture. Danish director Lone Scherfig took up the challenge and with the help of Nicholls himself as screenwriter, the adaptation of the novel premiered in cinemas in 2011. But could it achieve the difficult task of living up to its hugely loved, paperback counterpart? Sadly, the general consensus from critics and fans was a resounding no. Despite the film standing alone as a reasonable rom-com, it simply lacked the spark of the novel. The beauty of the novel is its unique format that breaks all of the rules of literary text books. The story opens on July 15th 1988 when two students, Emma and Dexter, wake up together on their last day of university. Somehow this awkward encounter marks the beginning of a friendship that forms the backbone of the novel with each chapter revisiting the two characters on this same day for the next twenty years. Sometimes they are together; sometimes they are apart. Sometimes the day is conveniently momentous and dramatic; sometimes it acts more as a narrative strategy to indicate how their lives have progressed (or failed to progress in Dexter’s case) in the past year. But either way it is a structure that works perfectly in the book and never fails to engage and entice the audience into reading on. In the film however, this original form makes the film seem too fragmented. Due to obvious time constraints, each year/chapter/scene (however you want to look at it) lacks the depth and detail that made the book so special. We don’t get the chance to get to know the characters at each stage, therefore we cannot fully appreciate their transcendence into the people that form the dramatic and heart wrenching climax. Some critics have suggested that the idea simply doesn’t work in film form and without the subtitles to indicate what year we are on, anyone who didn’t have prior knowledge of the book would fail to recognize this structure anyway – it would just seem like a regular movie storyline progressing over time. It is certainly no simple feat for two actors to try and convey the changes in personality, appearance and circumstance that any individual would encounter as they mature over a twenty year period. 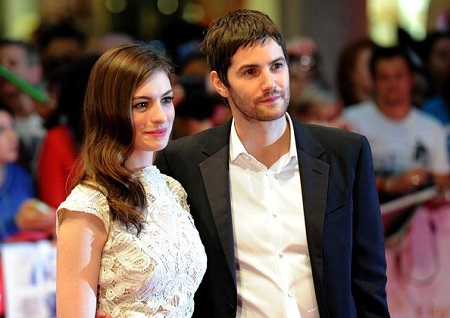 Having said that, Anne Hathaway and Jim Sturgess do generally portray the characters of Emma and Dexter very well. Hathway manages to pull off the humble, self deprecating personality of ‘our Em’ brilliantly despite facing criticism over her Yorkshire accent. Although it came under scrutiny from a lot of critics, it wasn’t quite the disaster that it could have been. Similarly, Sturgess manages to bring the character of Dexter to life in a way that makes him both thoroughly dis-likeable yet ultimately endearing at the same time. His arrogant laziness and thoughtless womanizing is designed to make the audience question why he would ever be the object of affection for an intelligent, down-to-earth girl like Emma. But his quest for rehabilitation almost becomes a story within itself and this is one part of the story that is at least explored a little more thoroughly in the film. However the complicated relationship that the two share is never really given the time or space to develop into the magical union that it was in the book. 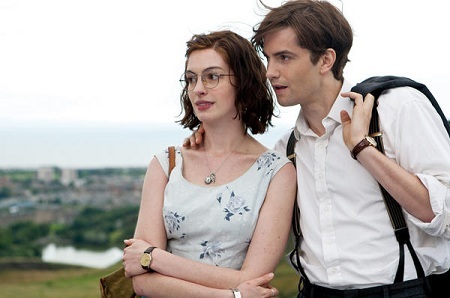 Whilst the viewer is aware that they are always destined to be more than friends, the film misses some of the comic, flirtatious and downright frustrating twists and turns of their bumbling romance and its fragmented form again disrupts character development and presentation. Whilst some of the early flirtatious scenes are very endearing, there is a lack of depth to their relationship. On the plus side, Scherfig and her team have excelled themselves in terms of location and settings. The cleverness and attention to detail in their sets have brought to life the grubby restaurant that downtrodden Emma worked in and the vibrant streets of Paris where she found her solace and escape. With great cameo performances from Rafe Spall who plays Emma’s unfunny comedian boyfriend and Romola Garai as Dexter’s uptight wife, there are certainly some positives to this film. But as is the case with many book to film adaptations, the reader will always be more in love with the characters they have imagined than the ones they are presented with on screen. Unfortunately One Day has not lived up to the expectations of many of its adoring fans, but that’s not to say that it is still a reasonable piece of filmmaking in its own right.